Nothing screams "Summer" more than watermelon. You can find me any day of the week stuffing my face full of fresh, juicy watermelon cubes, and I wanted to make a dessert to mirror my love for this refreshing treat. 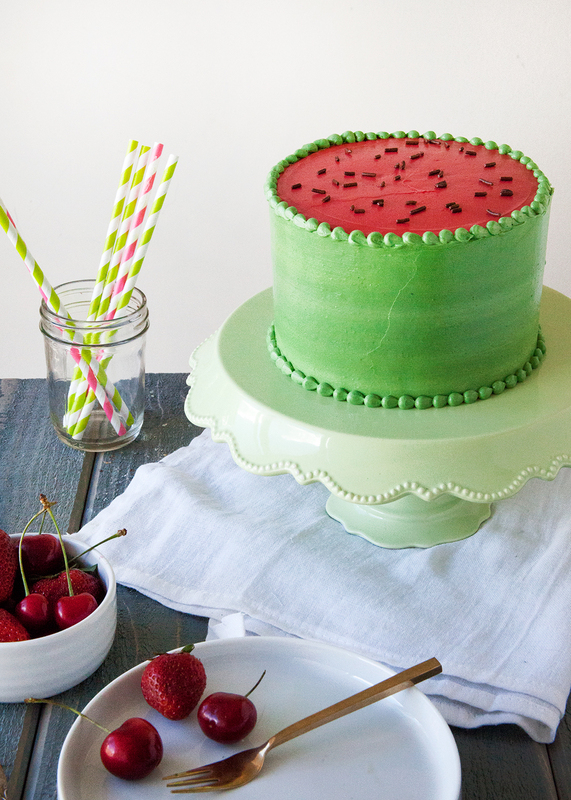 Let me introduce you to my Watermelon Cake. 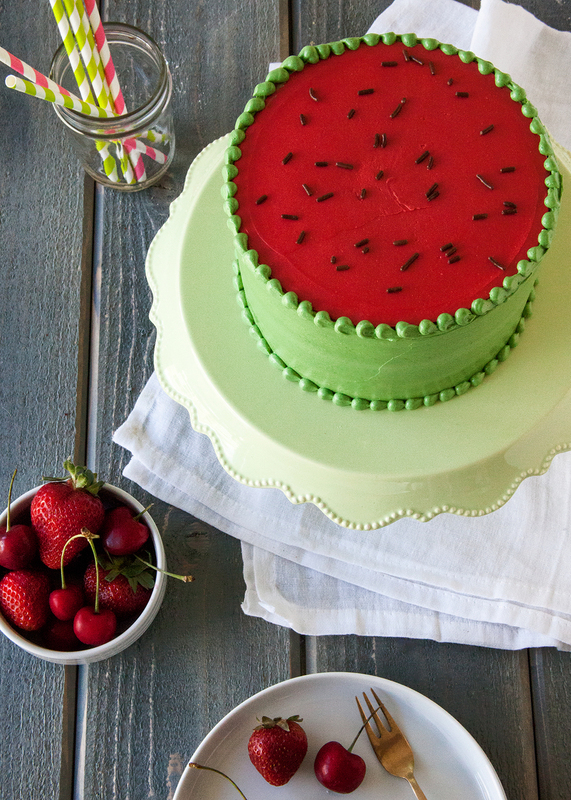 What is more appropriate to make a watermelon cake out of than Red Velvet Cake? Well, red velvet with chocolate chip "seeds" of course! 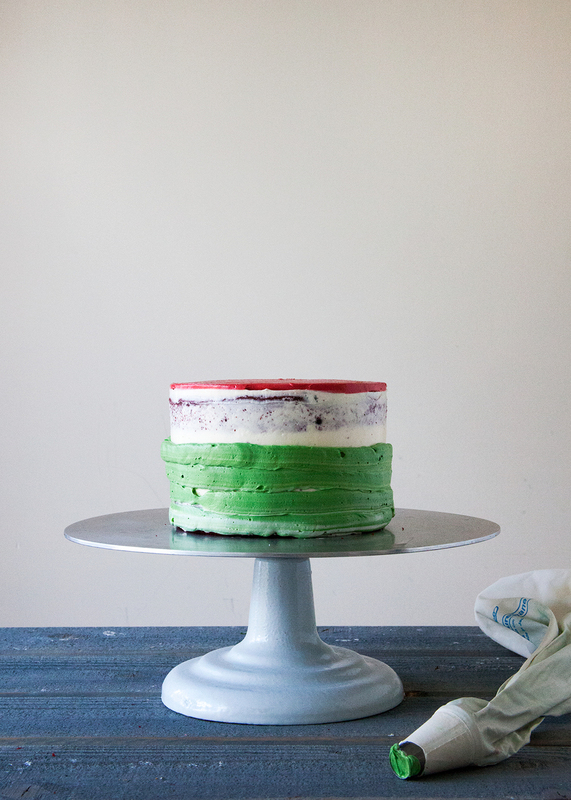 I took my favorite sour cream red velvet cake and dressed it up just like a watermelon. 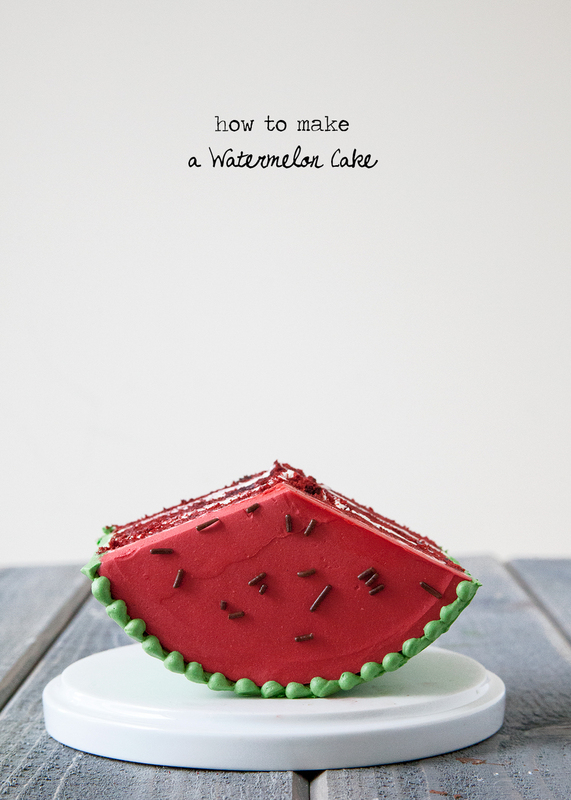 With green and red buttercream and even chocolate sprinkles, each slice of cake looks just like a slice of watermelon. 1. Prepare and bake Red Velvet Cake. Trim tops of any domed cakes, if necessary. 2. 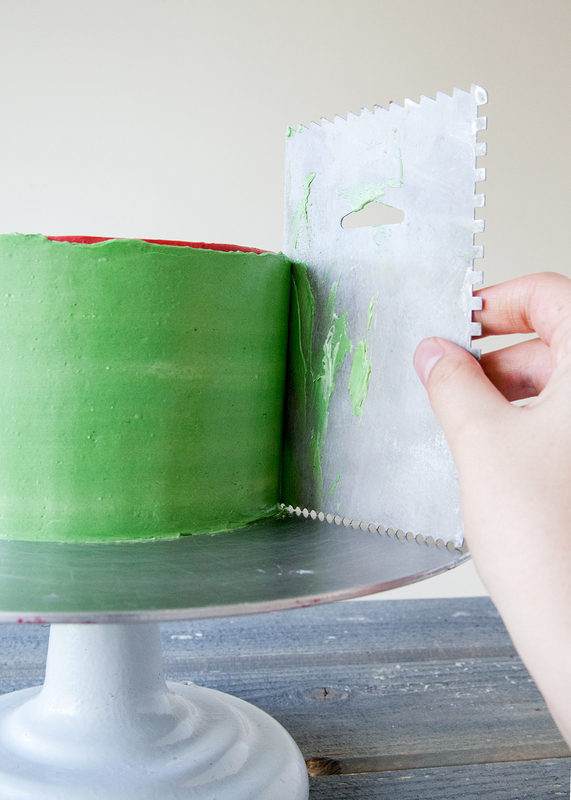 Place the bottom layer of cake on a cake board or turntable. 3. Fill a pastry bag fitted with a medium, plain piping tip with buttercream. Pipe a layer of buttercream onto the first layer of cake. Even out buttercream with a small off-set spatula. 4. Place the second layer of cake of top of the buttercream and repeat. 5. Place the third cake layer on top, bottom facing up. 6. Crumb coat the entire cake with a think layer of buttercream. 7. Tint about 3/4 cup buttercream watermelon red. 8. 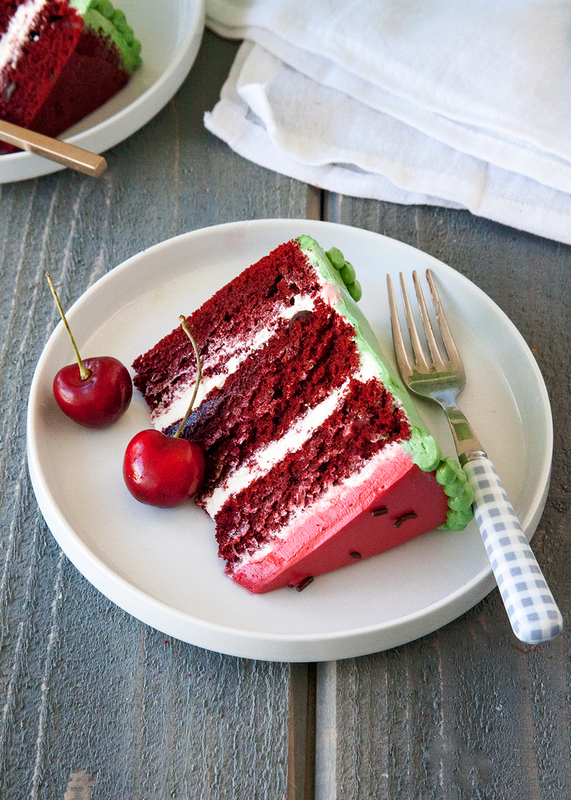 Place a large dollop of red buttercream on top of the cake. 9. Carefully smooth out the red frosting on top of the cake with an off set spatula. Be careful not to let any of the red frosting touch the sides of the cake. 10. Tint about 1 1/2 cups buttercream green. I made a leaf green and a lime green, then swirled them together - keeping the colors slightly under mixed and streaky like the outside of a watermelon. 11. Fill a pastry bad fitted with a medium, plain round piping tip with the green buttercream. 12. Starting at the bottom of the cake, begin piping flat rings around the sides of the cake. This will help control the icing and help keep an even layer. You do not need to pipe the thickness of the piping tip around the cake, a thinner layer will suffice. 13. 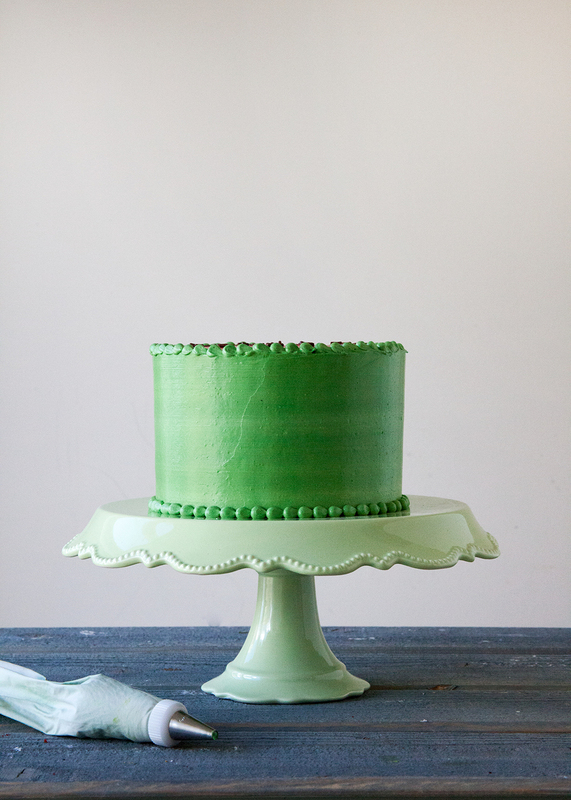 Be sure not to pipe any green frosting on the top of the cake. Once the sides are covered, taking an icing smoother to smooth out the sides of the cake. 14. Carefully transfer finished cake to a cake stand if desired. 15. Place any remaining free frosting in a pastry bag fitted with a small, round tip. Pipe a bead boarder around the bottom of the cake and the top where the red and green frostings meet. 16. Finish off the top with chocolate sprinkles!